The Philips Wake-Up Light Alarm Clock is designed to emulate sunrise: it uses faux sunlight to tell your brain that it’s time to wake up, which allows for a more natural wake up. It has 20 different light settings which begin 20 to 40 minutes before you want to wake up. In addition to the light, this also has five different wake-up sounds, all of which are calming. 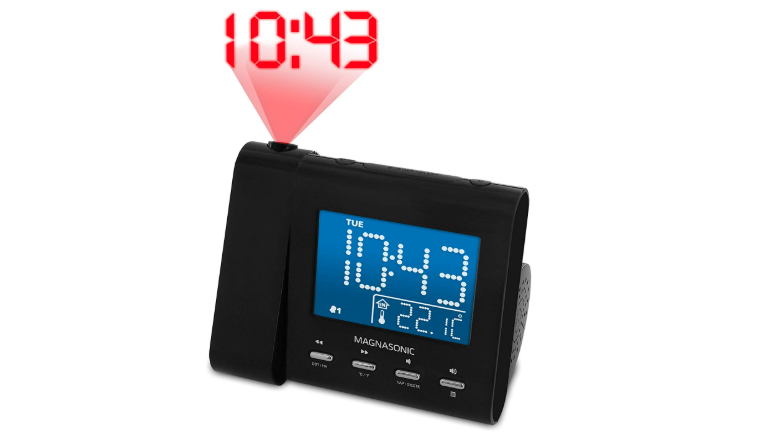 The Magnasonic Projection Alarm Clock is our favorite alarm clock for those who love music. It can connect to your iPhone, iPad, Android, or MP3 device or preset up to 20 radio stations. 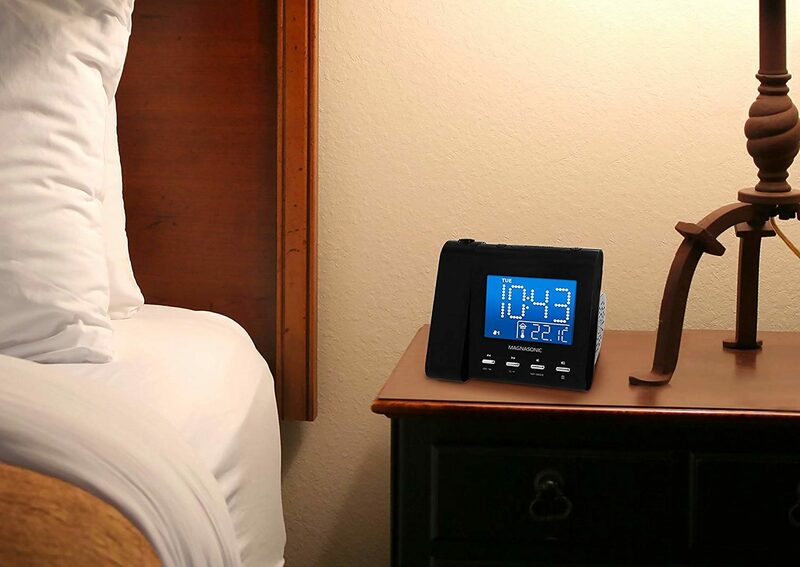 In addition to the great music features, this alarm clock also features a large LCD display with a swiveling projector, auto-adjusting time and date, daily dual alarm setting with optional weekend cancellation. If you’re a heavy sleeper and could sleep through a tornado, we know it takes a lot to wake you and are excited to introduce you to the Screaming Meanie: your new best friend (that you’ll love to hate). This alarm clock is small and compact yet LOUD. It has three volume settings: 70, 90, 120 dB. The loudest is described as being “as loud as a thunderclap or a chain saw at close range.” This alarm clock glows in the dark, comes in two different colors, and uses one 9 volt battery. It also requires two hands to turn off so it can’t accidentally be turned off should you roll onto it in the middle of the night! This alarm clock costs less than we spend at Starbucks in a week. It features a large, easy to read LCD display, has ascending alarm sounds, and is battery operated. It’s easy to transport and small enough for most bedside tables. It’s our top choice for the best affordable alarm clock. There are typically two camps of sleep that people fall into: the “I can sleep through a freight train!” camp and the “I wake up if I hear the faucet dripping” camp. If you fall into the latter camp, there are a few things you can do to ensure a better night’s sleep, but it likely doesn’t take a lot to wake you in the mornings when your alarm goes off. You may even be awake before it chimes, just staring at the ceiling anticipating its ring. If you can sleep through anything, however, that likely means you can sleep through your alarm. Which means you’ll need a good one. Looking for the best alarm clock so you don’t have to blame traffic for being late to work (again)? We’ve got you covered. We looked at multiple alarm clocks: ones louder than a chain saw, ones that shake the bed, and ones that gently wake you up. Our favorites? The gentle ones. 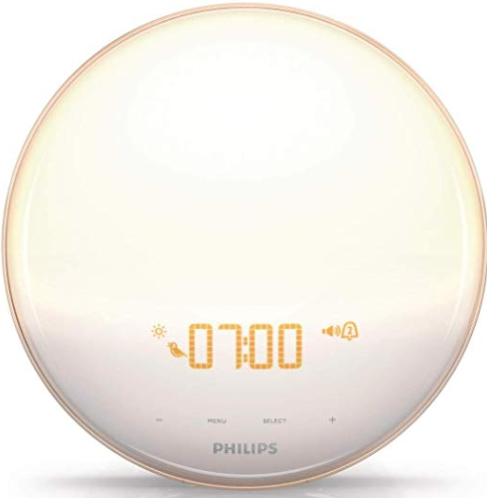 The Philips Wake-Up Light is in our minds the best alarm clock because it’s the least jarring as it’s designed to emulate sunrise. If you’ve ever studied bluelight, you know that it impairs your ability to fall asleep as it makes your mind think that it’s still daylight. This alarm clock does the opposite: it uses faux sunlight to tell your brain that it’s time to wake up, which allows for a more natural wake up. It has 20 different light settings which begin 20 to 40 minutes before you want to wake up. In addition to the light, this also has five different wake-up sounds, all of which are calming. Don’t like the sounds? There’s an FM radio setting you can listen to instead. If you’re looking for a reliable alarm clock and don’t want to spend a lot of money, chances are you don’t care about smart alarm clocks, alarms that vibrate to wake you up, or alarms that wake you up with a slowly increasing light display. You just want something that’s cheap, easy to read, has a decent sounding alarm, and will wake you up. 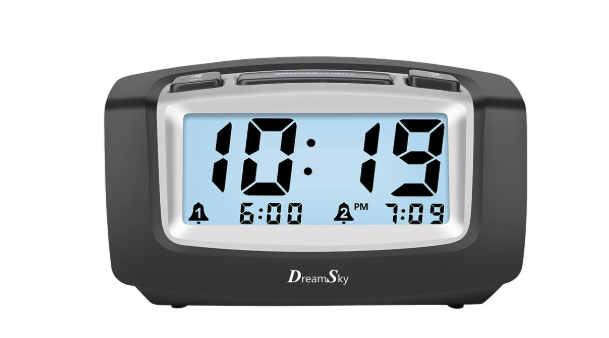 If that’s the case, check out the DreamSky Dual Alarm clock. This alarm clock costs less than we spend at Starbucks in a week. It features a large, easy to read LCD display, has ascending alarm sounds, and is battery operated. It’s easy to transport and small enough for most bedside tables. Oversize buttons: Makes hitting snooze a breeze! 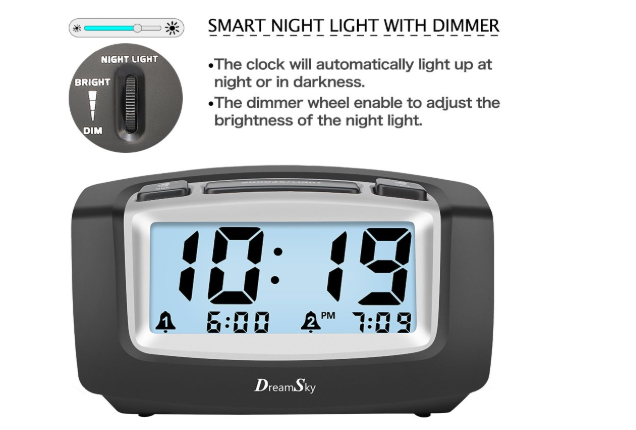 Limited functions: If you’re looking for a smart clock or something with a lot of functions, this isn’t it. If you’re a heavy sleeper and it takes a lot to wake you, the Screaming Meanie will be your new best friend that love to hate. 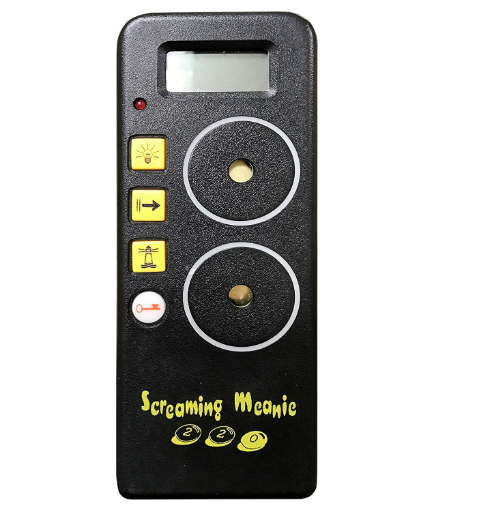 The Screaming Meanie is small and compact and perfect for travel (provided you have thick walls so your neighbors don’t complain). It has three volume settings: 70, 90, 120 dB. The loudest is described as being “as loud as a thunderclap or a chain saw at close range.” This alarm clock glows in the dark, comes in two different colors, and uses one 9 volt battery. It also requires two hands to turn off so it can’t accidentally be turned off should you roll onto it in the middle of the night! Love waking up (and perhaps even falling asleep) to the radio? If so, you’ll want an alarm clock that not only connects to the radio, but allows you to save your favorite stations. The Magnasonic Projection Alarm Clock is our favorite alarm clock for those who love the radio (or saved music). It can connect to your iPhone, iPad, Android, or MP3 device through the 3.5mm AUX input to allow you to play your favorite playlists, and also lets you preset up to 20 radio stations that can be accessed with the push of a button and be used as your alarm tone. If you like falling asleep to music, you can also use the sleep timer function and program the music to turn off at a specific time. In addition to the great music features, this alarm clock also features a large LCD display with a swiveling projector, auto-adjusting time and date, daily dual alarm setting with optional weekend cancellation. Swiveling projecting: Projects the time (and temperature if you wish) on your ceiling or wall so you don’t have to turn and face the alarm to see what time it is). If you’re looking for an alarm clock that gives more than an average wake up call, check out the Amazon Echo Spot. This smart alarm is one of our favorite alarm clocks due to its array of features. 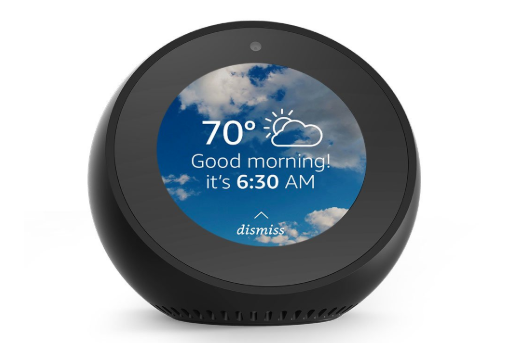 The Echo Spot is a home automation system. It connects to Alexa and responds to voice commands. In addition to waking you up (which it can do with a buzz, your favorite song or favorite recording), it can read the news, stream music, tell you the day’s weather, and even enable you to make online purchases. It can also lock your doors, activate your security system, adjust your thermostat, and even make calls! It’s also compact and features a 2.5″ high-resolution screen and a 1.4″ speaker. Nowadays, most people use their smartphone as an alarm clock. However, there are still some that prefer a true alarm clock. It could be a radio alarm, an extra loud alarm, or one that offers features such as white noise or a clock that can be seen all night long. When looking at alarm clocks, here are the key things to consider: volume levels, types of alarm sounds, display, power source, size and weight, additional features, connectivity, radio, and USB ports. If you’re a heavy sleeper you’re going to need a loud alarm, but if you wake up pretty easily you’ll be okay with a softer one. And if you have a partner that doesn’t wake up at the same time as you, your partner may prefer a lower volume alarm! Thankfully, most alarm clocks offer adjustable volume levels that can be set or changed to an ideal volume depending on your needs. Alarm clocks today typically have a maximum volume level between 60 decibels (dB) and 110 dB. Do you like to wake up to a buzzer? A beep? How about the radio, ocean waves, or something completely obnoxious like car horns? Nowadays, most alarm clocks offer a multitude of sounds and some even come with vibrating options as well. When thinking about the best alarm clock for you, make sure to consider what sound you’d prefer to wake up to. An alarm clock’s display is one of the most important features of an alarm clock. Some people like a bright display so they can see what time it is should they wake up in the middle of the night. Others despise the light the display emits and would prefer it to be dark. Keep in mind most displays offer adjustable light settings though, so check all the settings to see if you can find one that is right for you. Most alarm clocks these days are powered through AC electrical outlets, but some are battery-operated. Which do you prefer? If you have a small bedroom and nightstand, you may not want to deal with something that plugs into the wall, so in those cases, a battery-powered alarm may be best. However, if you have space, you may not mind an alarm that plugs into the wall. Should you go this route, just make sure it has backup batteries in case the power goes out! 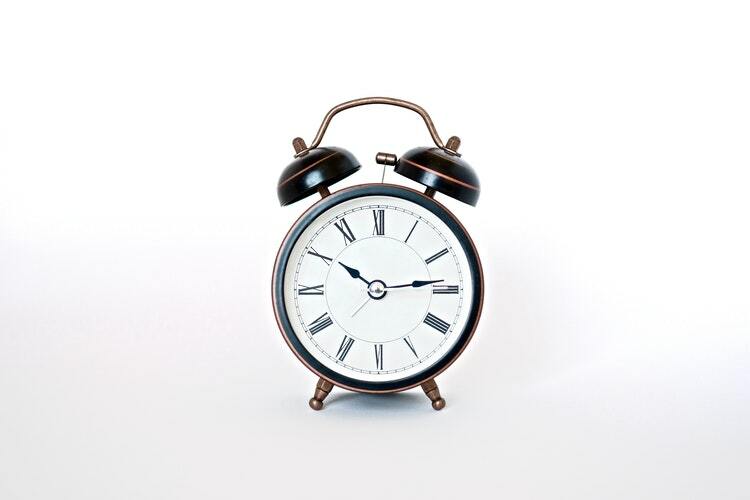 The size of your bedroom and nightstand not only affects your choice of alarm clock power source but also the size and weight of your alarm clock. If space is limited, you definitely don’t want your alarm clock to take up the entire side table! Thankfully most alarm clocks on the market are compact, but make sure you measure your space in advance to see what your size constraints are. If you’re looking for a basic, affordable alarm clock, then you likely don’t care about connectivity options. However, if you want something a bit more advanced, you’ll enjoy this feature. Some alarm clocks can connect to the internet, your smartphone, and even stream music via Bluetooth connections. With Apple music, Pandora, Spotify and more, radio has become more and more outdated. Which is a shame. If you still love radio and want to wake up to a surprise song (or morning show) rather than one you pre-programmed the night before, consider investing in an alarm clock with a radio. You can wake up to the morning news, NPR, and so much more. Radio can also be a less jarring way to wake up than a buzzer or traditional alarm tone. Smartphones these days are going wireless, even with their chargers, so not everyone uses USB ports anymore. However, if you have an older model that needs to be plugged into a USB port, if you want to connect your wireless charger overnight, or if you have other electronics that need to be powered via USB, you may enjoy an alarm clock with a USB port. The best alarm clock for you may not be the best alarm clock for everyone. Before purchasing, make sure you prioritize what’s important for you. Whether it’s a large display, a bright display, or something that will sound as loud as a chain saw, there’s something out there for everyone.